It can be so hard to find time during the day for our children, but it’s good to know the importance of spending time with children individually. Do you have a friend who really stands out and commands attention in a group? What about a friend who fades into the background and is almost forgotten in a group? Have you ever thought that within your family there is also a group dynamic that is very different from a one-on-one dynamic? This is the reason that individual time is so important. 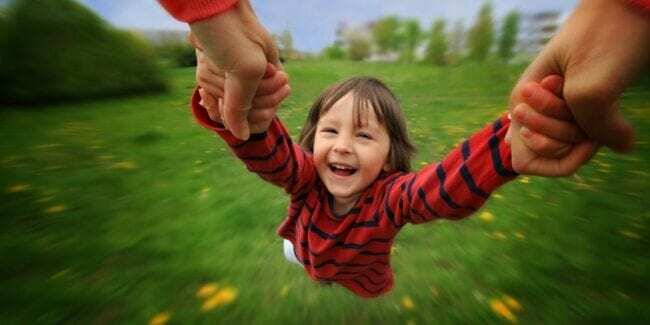 Some children only come alive when you get them alone and give them time. 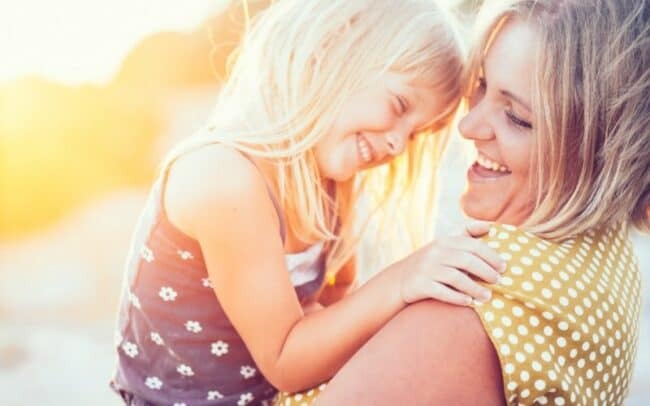 Spending time with your children individually is so very important, and when done regularly will reap many benefits for them, you, and your relationship together. Spending time with each child may be difficult when you have quite a few children and you are a busy and tired mom. Let’s be clear: you don’t need to spend every day all day staring into your children’s eyes telling them they are perfect. It’s not possible nor do they need that. But since it’s important, it’s good to find easy ways to make it happen so it doesn’t fall through the cracks. Use this individual child time tracker to make sure you’re getting time in with each child. Have you ever had a great friend you never spent time alone with? Because you get to be best friends with someone by spending a lot of time together, and much of that time will be alone. It will be the same with your children. Group dynamics are different from one-on-one dynamics, and when you are alone with one child they will have your undivided attention. They’ll also share things with you they wouldn’t share in a group. Children often act out in an attempt to get attention. Even my 3-year-old will try to get a compliment if I give one to his baby brother. “Wow, what a good clapper you are, little man!” Then he’ll start to clap or dance and say “mommy, clapping, good job?” It is built in our children to desire admiration and love from their parents. Spending time alone with each child will help to fill up their love tanks and there will be less of a need to fight for your attention. If you are a more shy and quiet person – particularly in a crowd – you will relate to this. If people only knew you as “one of the crowd” would they know the real you? Absolutely not. Quiet or shy children may just blend in and be content to go unnoticed beside their more outgoing and flamboyant siblings. By singling out your quiet child (and each child in the family in their own turn) you’ll show them that you are willing to take the time to draw them out of their shell. 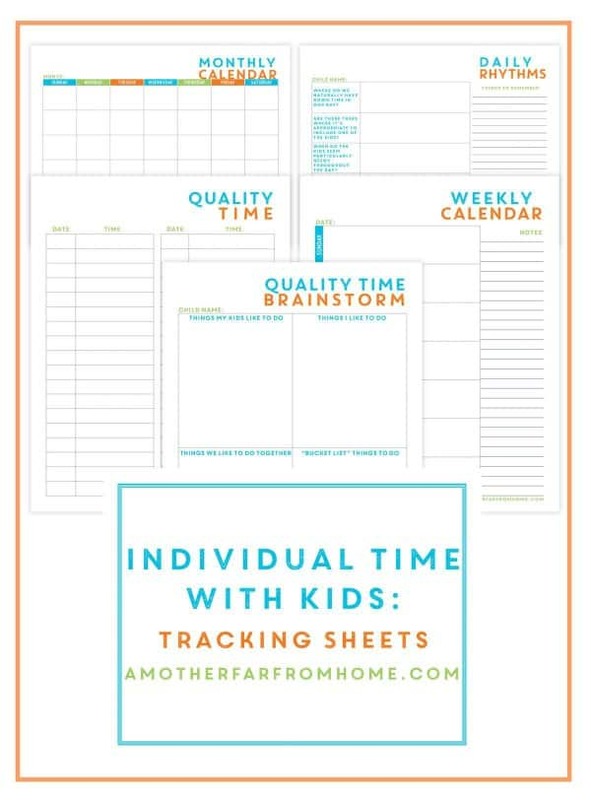 Use this individual child time tracker to plan time with your kids. If you spend a Saturday with one child every month (or at whatever frequency works for your family) this is a great time to go and do whatever is on their heart. Does your son love all things space? Why not take him to a museum, exhibit or park specifically oriented to his current phase? This will particularly be special for him because you two being alone means no one else (another sibling trying to complain about something) is there to say his idea is stupid, no fun, or uncool. Each child is different and this can be a time to embrace their individual differences and really help them to feel at home with you when they are in their element. At the dinner table you may have one or two who steer the conversation. They always have a funny story, joke or topic of conversation ready. That is not bad in itself, of course, but it may often leave some younger or quieter siblings in silence or unable to compete with the interesting talk. One child may never volunteer their story, sad moment, triumph or rejection with the whole family. They may not think it something that everyone should hear. If you’ve consistently carved out time with them and communicated that you are always there for them (and are willing to take some time away from everyone else) then they’ll be more apt to come to you with what is important to their heart. If they are hurt or really agonizing over something (as all kids do from time to time) you want there to be a clear open place for talk. And, you want them to know that their siblings don’t need to know about it. Have one child per night help you cook dinner. When possible, run errands with one child at a time. Take walks around your neighborhood (it’s free and exercise, win win). Join them alone for one of their interests (sports, dance, library, etc.). Do your individual chores together. Do home projects together. They must be done, so why not together? Remember, trying to treat everyone equally will never work. In fact, it will communicate a wrong message. Everyone is – in fact – not equal. Some are taller, some are shorter, some are funnier, some are smarter, some are more ambitious, and some are more artistic. You love them individually and for who they are as a person. Spending time alone with them on a consistent basis will help solidify their place in the family (in their minds) and will bring you both memories that will last a lifetime. Want to be sure you get quality time in? If you want to make sure each of your children get special time with you, but struggle to make it happen in the day to day it probably comes down to one thing: planning. Time flying past us really is a mother’s arch nemesis. This pack will help you take control of your time and priorities and make what’s most important happen. Click here to get instant access. That individual time is so valuable! I always can tell the difference in my daughter’s attitude once we’ve had a bit of alone time together. Love the idea of having one child each night help with dinner! Yes, a reader or friend suggested that, not sure which, but I think that’s gold. And too many cooks in the kitchen isn’t helpful anyway so it’s win win! Nina, I’m with you on that one! I often find the only (or best for us) way to do that is when the other kids are in their rooms playing (independent play) or in a nap. Or otherwise occupied by another adult. It’s SUPER hard to find time during the day if you’re the only one home and they are just sort of doing their own thing. If what you attempt to do is too interesting, you got it, others come. I do like it when you pointed out by reserving time to spend with the child one-on-one, then their appreciation tank will be filled and will reduce their desperate attention-grabbing behavior. If that is the case, then I really need to consider planning an alone time with my little girl and do activities together. I will start researching what I can do to make this happen. After all, I am noticing that she has become clingy. Thank you. I love my daughter, but sometimes I don’t know what to do as a mother to help her. Thank you for letting me know the benefits of spending one-on-one time with my child. I also found the list very helpful of things I can do with my daughter. 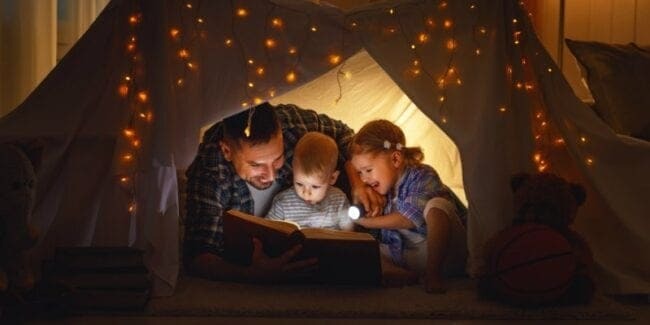 The idea of reading books together really made me happy. It made me think about the time I spend with my mom as a child. I’ll need to find more books for children. Hi, I am Margaret Rodgers. Thanks for your great article. I am very much cautious about my raising child. Actually, My kids are zeal of playing with the bounce house. It’s good for kids health and helps to grow up very well. And When I see their joy knew no bounds then, I feel very happy. I think they are much more secure than the toys you might give your kids. Toy parts can be harmful if swallowed and this is not the case with any bouncy products. My doctors have also said that kids who want to grow taller should be consistent in jumping and reaching for higher objects this stretches out the bones improving their height.